Hello, my friend, I hope you are having a wonderful Friday. The sun has finally come out again after some pretty gray days. I am grateful for the sun coming this weekend but not the humidity. I mean really, we are a little over a week from the first day of fall and I really want to put away my shorts. My whining aside, my thoughts are still with the devastating storm that has now settled in on the Carolinas. Most of the people don’t have flood insurance so it will be a long road to recovery once this storm moves on. On a happy note, I just now confirmed that I will be spending some much needed time with my crafty crew this Saturday. I think it was last spring since I have seen some of them so I am way overdue. Not sure what I will bring to play with while catching up but I am sure I will bring too much. It’s funny how excited I get when I know we will all get together. I have known these women, for so many years and it never gets old. So I will update you on my girlfriend time next week. 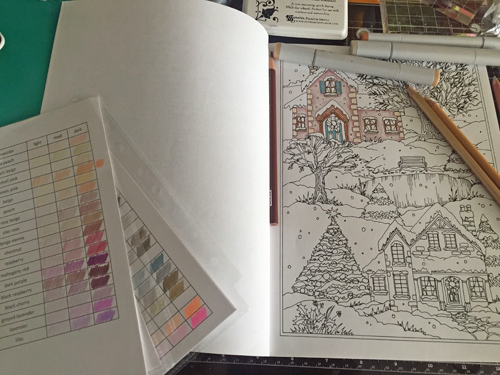 Today I included a couple of photos of a completed coloring page I colored this summer. As many of you may know, I started playing around more seriously with my colored pencils after the new year and have been having a blast. I took the summer off from work so my Copics collected a little dust! The cool thing about this page is that I pushed through my perfectionist ways to complete it. I didn’t want to sit paralyzed trying to select the perfect colors. Instead, I just picked colors and went for it. I even added some Wink of Stella to the bubbles so they sparkle a bit. This is one of my newer coloring books from a German artist, Rita Berman. I have recently acquired a very lovely fall themed coloring book that I can’t wait to crack open. So I will share pages as I work and complete them. I hope you all have a blessed weekend and please put others in need in your prayers. My desk is looking a bit similar to last week. I couldn’t shake the allergy symptoms which made for poor sleep and lousy congestion that made my ears feel like I just got off a long flight and they haven’t decompressed. Unfortunately, I was quite cranky and unproductive for much of the remainder of the week. 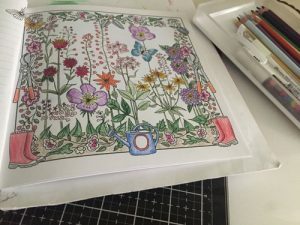 However, Saturday morning I rose from my fitful slumber to watch the Royal Wedding and I decided to bring along the coloring book and my pencils. I made some tea and some breakfast and sat and watched all the guests arrive and managed to finish coloring this page from last week before the start of the actual wedding. Once the ceremony started my eyes were glued to the screen. It is hard to convey the awe and pride I had watching this ceremony. As an African American, I felt so proud. Living in a country that is currently undergoing some major turmoil and division in our governmental infrastructure as well as race relations, I find I am desperately seeking to find the light again. 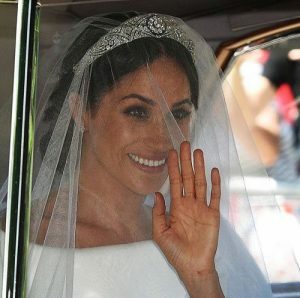 This wedding gave me a moment to rest my head from the daily stress of our current chaos and enjoy a beautiful and symbolic union of Prince Harry and Meghan Markel. II have a dear friend that is blessed with the opportunities to go to Disney World. She knows my favorite princess is Tiana, which is the only African American princess created by Disney. I have collected a few of her dolls and other items. But my point that I am going for is that now I have a real African American princess to adore. But I digress. 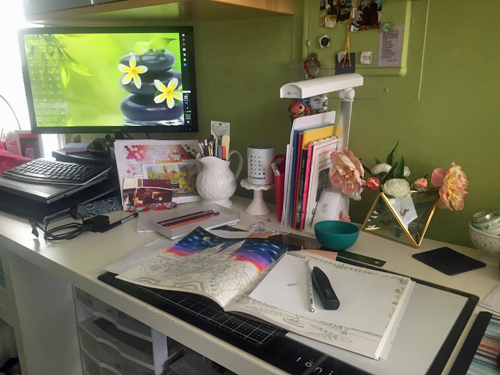 Let’s stop the gushing and talk about my desk. Check it out! I have the completed page I started last week. Ha…I actually finished it to share! I think WOYWW helps on the accountability pressure!! 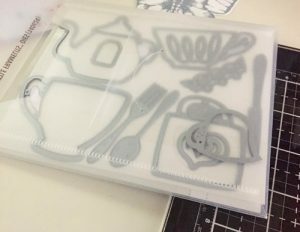 Other items are this beautiful tea themed dies set I bought from my girlfriend over a year ago. Actually maybe longer. I hardly used it to so I was thinking I need to play with it. I am still loving my little tray to hold the colored pencils I use for a page. 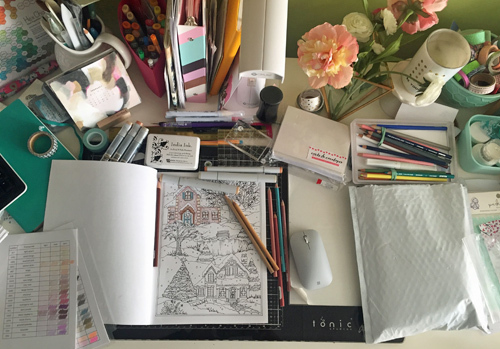 Lately, I leave my big case on the shelf once I have selected my colors and it makes for less clutter on my desk while I color. On the left is the edge of my bullet journal (it’s turquoise). I just started using it this year instead of a planner. I am really loving the full flexibility and I am not at all upset that I fit half a year in this one so I ordered another, same color to finish off the second half of the year. I also journal in it which I believe led to more space needed but I like having everything in one place and I keep it simple so it’s fun to return to rather than a chore. Ok, I am going to stop babbling and end this post. I will stop by to visit you all tomorrow because today I am loaded down with appointments and work. Good morning my crafty WOYWW friends! 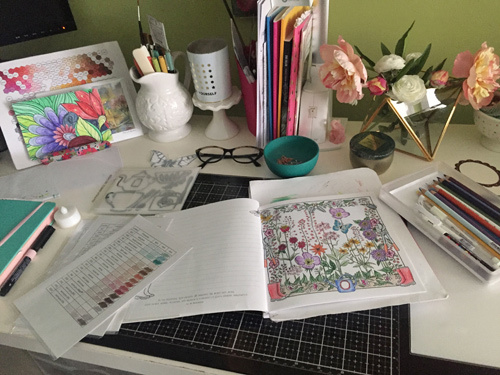 For those of you that aren’t familiar with WOYWW (What’s On Your Workdesk Wednesday), head on over to Julia’s Stamping Ground and you will find desks from all around the world for What’s on Your Workdesk Wednesday. 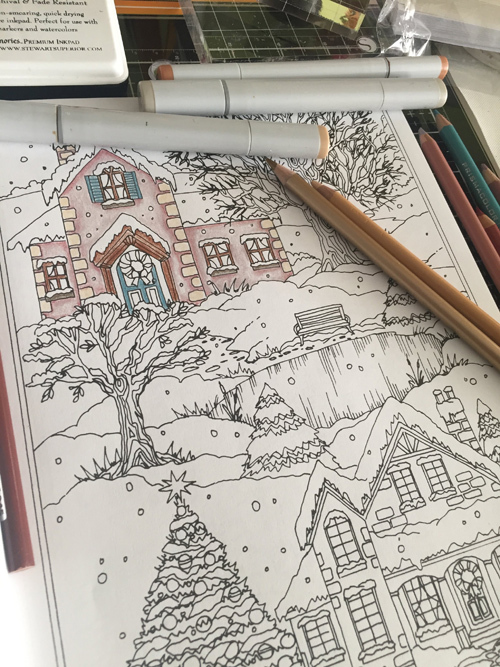 This morning I am working on a new coloring book that I bought a few months ago. 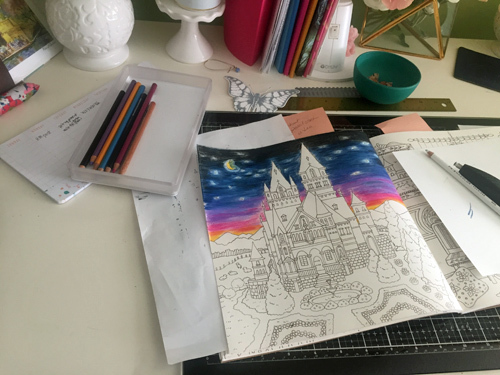 It is a lovely Korean coloring book called, “Romantic Country: Cocot–The Land of Beautiful Towering Castles by Eriy. 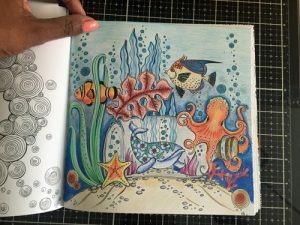 I have found a bunch of wonderful international coloring books that I have added to my wish list. This one is so pretty. 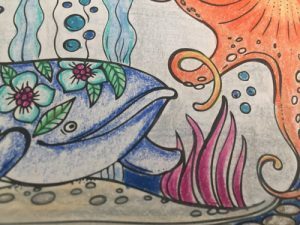 I found a colorist on YouTube that created a night sky on this page so I am following along trying to re-create her magic in my book. I am using my Prismacolor pencils and working through the stages of layering colors and then I will add stars. I will be sure to share the completed page when I finish. 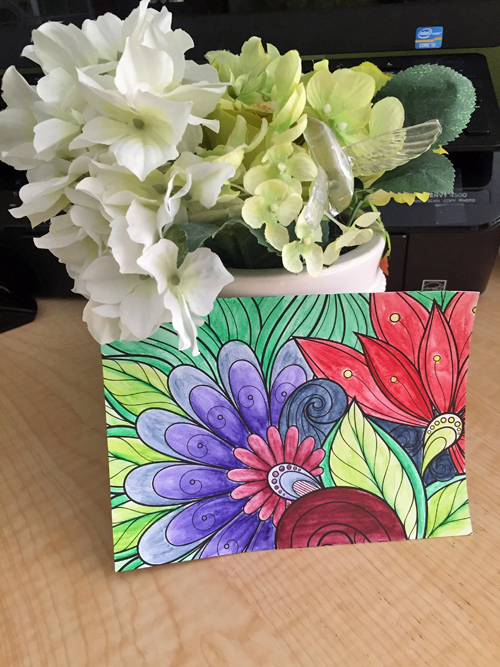 Update on last weeks’ craft project – the watercolored postcard. I finished it and still haven’t mailed it off to my friend. I am pleased with it and will definitely be using the Inktense to color more of those postcards. You can see the finished postcard below. I like how vibrant the colors became once activated. I am pleased to say there was no warping or bleeding through so the postcard is perfectly useable. Ok, I am off to continue on this night sky and then to peek at your desks. Last week, I saw so many pretty and inspiring art. Thank you for sharing.